We came, we saw, we uploaded lots of stuff onto the internet. NAMM 2014: The 2014 Winter NAMM Show may now be nothing but a memory, but the products that were launched there will stay on the agenda right through the year. We saw new synths, controllers, software, guitars, amps, pedals and drum kits and DJ gear galore, all of which should be coming your way over the next few months. To whet your appetite, take click through our NAMM 2014 round-ups, which we've listed below. 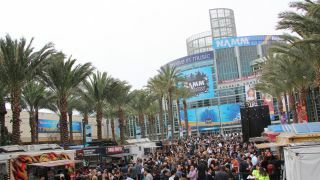 And if you're suffering from the post-show blues, rest assured that Team MusicRadar will be out in force during Musikmesse 2014 (12-15 March) and back in Anaheim next year for Winter NAMM 2015.